Jennifer Hudson performs during the the March for Our Lives rally in Washington, D.C. on March 24, 2018. Imagine you are 13 years old, on the cusp of adolescence. You are sitting in a comfortable suburban home, watching a news program about a civil rights protest. Young people, not much older than you, are being beaten with water from fire hoses and attacked by police dogs. The images shatter your comfortable world. You feel angry, confused. You want to do something, but you're not sure what. That 13-year-old was me. And right around that same time, I discovered Bob Dylan. Pretty much nothing was ever the same after that. When Dylan first hit the music scene, Joan Baez was the reigning queen of folk. She would soon fall in love with both the man and his music — but even today, Baez doesn't pretend to know what went on in Dylan's head when he wrote the song "The Times They Are a-Changin' " in 1963. Though it may have become an anthem, she doubts that's what he set out to create. "It's impossible to write an anthem. I would never attempt it," Baez says. I mean, I think there are a lot of well meaning, politically intelligent musicians who've written a lot of songs. But to get people to really relate to it and sing along and have this sort of universality of time and place, that's different, you know? That's difficult." At the time, Dylan's music was like nothing you'd ever heard before — not just that twangy, nasal voice, but the lyrics, too. Anthony DeCurtis, a contributing editor at Rolling Stone, grew up in New York's Greenwich Village near the folk clubs where Dylan got his start — but says he might as well have lived a million miles away. He came from a conservative Italian family, whose values he was starting to question. "Some of the rock stars that was I so infatuated with had a view of society that was very different from what my family, and certainly my school, was trying to instill in me," he says. "So I was trying to understand, and Dylan was very important in that process." Inevitably DeCurtis, like so many other young people, was drawn into the movement against the war in Vietnam — which was quickly developing from peaceful protests to a growing militancy. "It was people who felt like they were in a battle," he says. "And, you know, you can go back to the 'The Times They Are a-Changin' ' for that: The line has been drawn, the curse has been cast. You really felt you had to stand on one side or the other." As the 1960s faded into the '70s, the urgency of the song faded, too. Bob Dylan moved on to other things, and the generation he first sang for grew up and became mothers and fathers themselves. By the time a new generation came along, the times had already changed. Matt Malyon was born in 1971. He was in his 20s before he discovered Bob Dylan. "There was a budget tape, The Freewheelin' Bob Dylan, in Tower Records," he recalls. "A cassette tape, if you can remember that technology." Malyon thinks "The Times They Are a-Changin' " is more relevant now than ever. He teaches writing to teenagers in Seattle, many from immigrant families. When he played this song for his students he thought they would like the poetry of the lyrics. Instead, they were caught up in the meaning of the words. "When I made reference to, this song coming out of the '60s, and [being] about the '60s, there were some blank stares. And yet, the song spoke to them," he says. "They see these words as living. It's not something anchored to the '60s, it's something live, and now. And I think that ties to the timelessness of the piece." The group's director, Jonathan Ball, says he was surprised at the invitation: He hadn't known the song, nor had most of the members. But as they started to rehearse, he says, the lyrics took on more meaning, and he began imagining what it would be like to sing those words — "Come senators, congressmen, please heed the call" — at the demonstration. "In my mind, when I was arranging the part, I was like, I hope the president hears this," Ball says. "I hope the powers that be, the senators, the congressmen, are actually listening — and like a movie, almost, they hear the music and they write a new law." Erika Edmund is the group's lead singer. She says the the full impact of the song really hit when the choir sang it during the march, "because we were there looking at all of these people. I would look into the crowd seeing people crying — you know, you had families, you have people that are begging, screaming for change. So it makes it easy for me to sing this song, because it means so much to what I've seen now." Choir member Therron Fowler was amazed that one song could be so powerful: "This anthem, it brought us together for something bigger than ourselves. No matter what race, what culture, background, religious whatever, it brought everyone together." And so, 50 years after Dylan wrote it, "The Times They Are a-Changin'" vibrates with new meaning. Perhaps that's because the song itself doesn't look to the past — rather, it's an anthem of hope for a future where change is always possible. 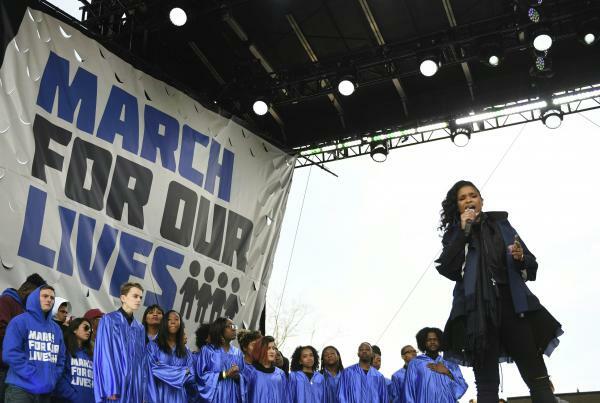 When thousands of young people descended on the National Mall earlier this year for the student-led March for Our Lives, singer Jennifer Hudson ended the event with an emotional rendition of Bob Dylan's "The Times They Are A-Changin'." JENNIFER HUDSON: (Singing) Come gather 'round, children, wherever you roam, and admit that the waters around you have grown. MARTIN: Dylan wrote that song in 1963 when the civil rights movement was underway and demonstrations against the Vietnam War were gearing up. It would become the anthem of his generation. Now it vibrates with new meaning, as NPR's Lynn Neary reports for our series American Anthem. LYNN NEARY, BYLINE: Imagine you're 13 years old, on the cusp of adolescence. You're sitting in a comfortable suburban home, watching a news program about a civil rights protest. Young people not much older than you are being beaten with water from fire hoses and attacked by police dogs. NEARY: The images shatter your comfortable world. You feel angry, confused. You want to do something, but you're not sure what. That 13-year-old was me. And right around that same time, I discovered Bob Dylan. Pretty much nothing was ever the same after that. BOB DYLAN: (Singing) Come gather 'round, people, wherever you roam, and admit that the waters around you have grown. And accept it that soon you'll be drenched to the bone. NEARY: When Bob Dylan first hit the music scene, singer Joan Baez was the reigning queen of folk. She fell in love with both the man and his music. But even now Baez doesn't pretend to know what went on in Dylan's head when he wrote "The Times They Are A-Changin'." It may have become an anthem, she says, but she doubts that's what he set out to create. JOAN BAEZ: It's impossible to write an anthem. I would never attempt it. I mean, I think there are probably a lot of well-meaning musicians who have written a lot of songs. But to get people to really relate to it and have a sort of universality of time and place - that's difficult. And that's what this song does. DYLAN: (Singing) For the times they are a-changin’. NEARY: Dylan's music was like nothing you'd never heard before. It wasn't just that twangy, nasal voice. It was those lyrics. DYLAN: (Singing) Come, mothers and fathers throughout the land, and don't criticize what you can't understand. Your sons and your daughters are beyond your command. NEARY: Anthony DeCurtis grew up in New York's Greenwich Village near the folk clubs where Dylan got his start. But DeCurtis, who is now a contributing editor at Rolling Stone, says he may as well have lived a thousand miles away. He came from a conservative Italian family whose values he was starting to question. ANTHONY DECURTIS: Some of the rock stars that I was so infatuated with had a view of society that was very different from what my family and certainly my school was trying to instill in me. So I was trying to understand. And Dylan was very important in that process. NEARY: Inevitably, DeCurtis, like so many other young people, was drawn into the anti-war movement. UNIDENTIFIED REPORTER: Anti-war demonstrators protest U.S. involvement in the Vietnam War in mass marches, rallies and demonstrations. NEARY: It was a movement, DeCurtis says, that quickly went from peaceful protests to a growing militancy. DECURTIS: It was people who felt like they were in a battle. And, you know, you can go back to "The Times They Are A-Changin'" for that. The line has been drawn. The curse has been cast. You really felt like you had to stand on one side or the other. DYLAN: (Singing) The line - it is drawn. The curse - it is cast. The slow one now will later be past as the present now will later be past. NEARY: As the '60s faded into the '70s, the urgency of the song faded with it. Bob Dylan went on to other things, and the generation he first sang for grew up, became mothers and fathers themselves. By the time a new generation came along, the times had already changed. Matt Malyon was born in 1971. He was in his 20s before he discovered Bob Dylan. MATT MALYON: There was a budget tape, "The Freewheelin' Bob Dylan," and I bought it. A cassette tape, if you could remember that technology. NEARY: Maylon thinks "The Times They Are A-Changin'" is more relevant now than ever. He teaches writing to teenagers in Seattle, many from immigrant families. When he played this song for his students, he thought they would like the poetry of the lyrics. Instead, they were caught up in the meaning of the words. MALYON: The song spoke to them. They see these words as living. It's not something anchored to the '60s. It's something live and now. And I think that ties to the timelessness of the piece. NEARY: When Jennifer Hudson sang "The Times They Are A-Changin'" on the Mall last spring, she was backed up by a choir of young people. JONATHAN BALL: All right, let's run it from the top. NEARY: Ranging in age from 13 to 30, they meet regularly to rehearse in Columbia, Md. ERIKA EDMUND: (Singing) Come gather 'round people wherever you roam. DESTINY ROAD CHOIR: (Singing) Gather round, gather round. NEARY: Choir director Jonathan Ball says he was surprised when the choir was asked to sing "The Times They Are A-Changin'" at the march. He didn't know the song, and neither did most of the members of the choir. Ball says as they started to rehearse, the lyrics took on more meaning for all of them. He began imagining what it would be like to sing those words - come, senators, congressmen, please heed the call - on the National Mall. BALL: In my mind, when I was arranging the part, I was like, I hope the president hears this. I hope the senators, the congressmen are actually listening. And like a movie, almost - like, you know, they hear the music, and they just, like, write a new law. EDMUND: (Singer) Come, senators and congressmen, please heed the call. Don't just stand in the doorway. Don't you block off the hall. NEARY: Erika Edmund is the lead singer. She says the full impact of the song really hit when the choir sang it during the march. EDMUND: Because we were there looking at all these people. I would look into the crowd, seeing people crying. You know, you had people that are begging, screaming for change. So it makes it easy for me to sing this song because it means so much to what I've seen now. NEARY: Choir member Therron Fowler was amazed that one song could be so powerful. THERRON FOWLER: This anthem - it brought us together for something bigger than ourselves. No matter what race, what culture, background, religious - whatever. It brought everyone together. NEARY: And so a new generation takes up the anthem that inspired young people more than 50 years ago. But it's not a song that looks to the past. It's an anthem of hope for a future where change is always possible. Lynn Neary, NPR News, Washington. HUDSON: (Singing) For the times they are a-changin'. Transcript provided by NPR, Copyright NPR.